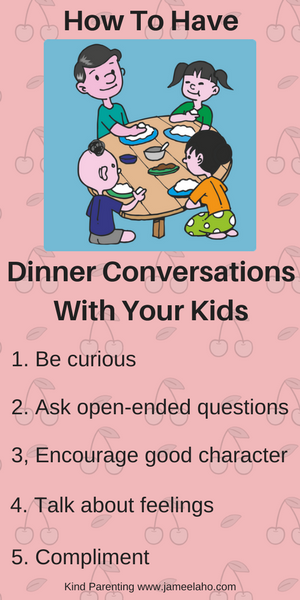 Mealtimes are an important part of the day for talking with each other and sharing what you did during the day with your family. It's a time when everyone is in the one same place. Each family is different so it could be for breakfast, lunch or dinner. 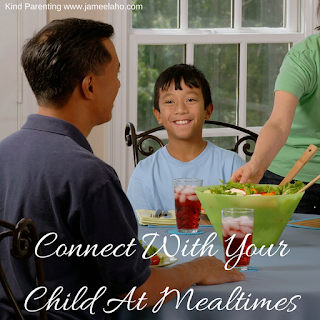 Whatever you do, have at least one mealtime that you consistently sit together to share your meal. For most people, this would be dinner. At dinner at our house everyday, we sit together and eat together. We only have one rule during our mealtimes together and that is to have no electronics or anything else except ourselves at the table. This means that the television, phones, tablets, computer, handheld games and even books are not allowed. This keeps us focus on each other and makes it necessary to start and continue conversations. This is one way that we connect with each other. If your family doesn't have a set time for having a meal together or everyone is eating in front of the television or there are distractions at the dinner table then now is the time to start over. Make this a part of your family rule to have meals together without distractions so you can start connecting with your children and your spouse. Ask curious questions not to interrogate but to learn more about each member. If someone doesn't answer then don't keep on persisting with the same question because for one, it was probably a closed question and for two, it'll be like you're grilling them. No one likes to be grilled. Don't ask closed questions that has a one word answer such as "How was your day?" "Good." "Did you have a fun time today?" "No". Ask open-ended questions such as "What did you do that was fun or not fun today?" and "What happened next?" 3. Encourage good character traits. To encourage kindness in your children, you can ask questions like "What was one kind thing that you did today?" You can then briefly tell your one act of kindness and then ask everyone to come to dinner each day with a story of what they did. You could encourage other good character traits this way. For example, you could do this with gratitude and ask "What's one thing you're grateful to Allah for today?" Encourage your children to talk about their feelings because when something is named then it can then be dealt with instead of being kept hidden. Ask questions such as "What did you feel when you did that? ", "What is your biggest fear? ", "Why do you think you felt that way when that happened?" and "What is the bravest/scariest thing that you did today?" Look for something good to say about each person. Be sincere and mean what you say. When you compliment someone on something, it opens up the conversation for your child to talk about that thing. Want to connect with your child more? 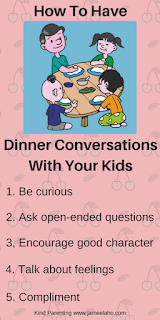 Read Connect With Your Child Through Bedtime Rituals.